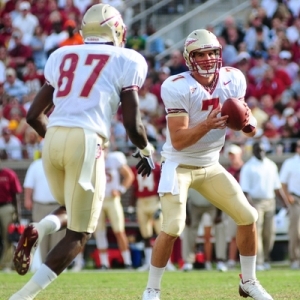 Florida State Seminoles - The biggest change here is a great one - the coaching staff. You can’t possibly convince me that Bobby Bowden has added enough value over the last few years to overcome all of the distractions, so his retirement is certainly welcome. Jimbo Fisher is the real deal, and he has assembled a good staff, so the coaching is going to be at a much higher level than it has been. On top of that they have a very nice quarterback to work with in Christian Ponder, and they have a defense that could be pretty good. They have a brutal non-conference schedule, but that could actually be an asset for them. If they can win at Oklahoma and beat BYU at home then they are going to make a lot of people take notice. In the ACC they manage to avoid both of the Tech schools - Virginia and Georgia - and they get North Carolina and Clemson at home. If they do manage to survive up until they end then they really have a chance to make a lasting statement - they close the season at home against Florida. Wisconsin Badgers - There’s a lot to like about these Badgers - something that could be said about their team the last couple of years as well. It starts up front - the offensive line is as big and corn-fed and you would expect a good Big Ten squad to have, Scott Tolzien is a reasonably good quarterback who can be trusted in tough situations, and John Clay is the kind of big, bruising back that can pile up a ton of yards. Their schedule does them a lot of favors as well The non-conference schedule is virtually a guaranteed four wins, they don’t have to play Penn State, and Ohio State travels to Madison for their showdown. The toughest game is a trip to Iowa - more on them in a second - but beyond that it’s a kind schedule. Ten wins is easy to see, and there isn’t a game that they can’t win if they are as good as they look to be. Iowa Hawkeyes - The Big Ten is going to have a team that ends up high in the rankings. I clearly respect Wisconsin, Ohio State can never be ruled out, and I always hold out hopes of a miracle for my Wolverines, but Iowa is the team I would least like to play this year. The team has 15 starters returning from a squad that made the BCS last year. Ricky Stanzi isn’t an elite quarterback, but he was solid last year, and will be even better this year if he can control his turnovers. The running backs are really good, and the receivers are the best that Kirk Ferentz has ever had. They are anchored by an offensive line is younger than would be ideal, but which is huge and highly-regarded nonetheless. It’s on defense that they really shine, though. Adrian Clayborn is absolutely terrifying at defensive end, and is going to win a whole lot of hardware this year if he plays like he did last year. He’s the best of the linemen, but the rest are darned good as well. They have depth at linebacker, and a strong secondary. This is a team that was very hard to score against last year, and it’s only going to get worse this year. On top of all that, the schedule is a gift - they get the only three tough teams on their schedule - Penn State, Wisconsin, and Ohio State - all at home. Nebraska Cornhuskers - Bo Pelini has done a remarkable job of turning this team around in a short time, and the progress looks to continue this year. His team has a lot of things going for it as it tries to be a sleeper and climb high up the rankings - national attention because of the impending move to the Big Ten, national respect after almost upsetting Texas in the Big 12 championship last year, and some nice talent on both sides of the ball. Most significantly, though, their schedule is firmly in their favor because it is going to add up to a lot of wins. Nine of their games are nearly certain wins if they are even just a pretty good team. A trip to Washington could be tough if the Huskies are playing well, but Nebraska will be ready for Jake Locker and company. Texas A&M is always a tough team to travel to. Where this season will be decided, though, is in that Big 12 Championship Game rematch. Texas travels to Lincoln on October 16 in a massive game for both teams. If Nebraska wins that game - and especially if they are 5-0 heading into it - then their spot near the top of the rankings is all but assured. Doc’s Sports went 7-1 for member’s NFL picks in the 2009 NFL Preseason and we are very excited about the 2010 slate of exhibition games. Our picks against the NFL line for the entire NFL Preseason are just $49. Also, our Early Bird Special for the NFL full season is just $695 and that will get you all the picks from the first kick in preseason to the Super Bowl (normal price will be $950). Check our home page daily for NFL handicapping articles and up-to-the-minute updated odds.